Here is a breakdown of the fights on the main card of Saturday’s UFC 202 event at T-Mobile Arena. ■ Storyline: This fight feels like a toss-up as a case could be made for either fighter. 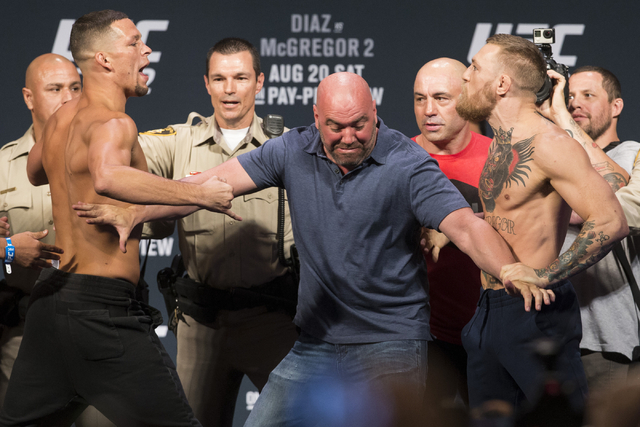 McGregor is known for his power and precision striking, while Diaz is a volume puncher with a vastly superior ground game. 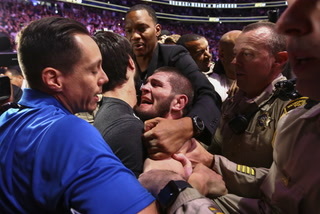 In the first fight, McGregor had his way for a round-and-a-half before he suddenly gassed and several big punches stopped him in his tracks and eventually set up the submission win for Diaz. McGregor was moving up in weight and says his fatigue was largely due to the surprise of Diaz not dropping from shots that would have finished his previous opponents at his own weight and not adding pounds the right way. He says he is fully prepared for all of that this time. Diaz, however, is very difficult to finish and there is that variable of Diaz’s massive grappling edge. If he chooses to take the fight to the ground, it could end quickly. That’s just not Diaz’s style, though. More likely, he will elect to slug it out with McGregor. Even in the first fight, the finish only came on the ground after an exhausted McGregor mysteriously shot for a takedown. The fight remaining on the feet will certainly keep it entertaining and in a place McGregor has a chance to avenge his loss. He still may not be able to finish Diaz, but McGregor is very good in a striking battle. 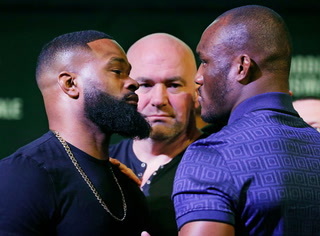 ■ Storyline: Johnson has lost just once in the last four years and it was against Daniel Cormier, the light heavyweight champion and arguably the best fighter in the world. 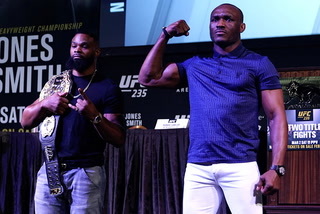 He will get another shot at Cormier with a victory here and it’s his power that is going to get him that opportunity. There are very few people in the world who hit as hard as Johnson. His last four victories have all come by knockout, with three of them in the first round. Teixeira has only been knocked out once in his pro career and it was in his debut in 2002. Johnson will certainly test that streak. 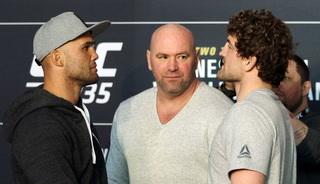 Teixeira has plenty of power of his own, but this should turn into a battle of power punches and that’s just not a good place to be against Johnson. ■ Storyline: Cerrone had his eight-fight winning streak snapped with a lightweight title loss to Rafael dos Anjos in December. 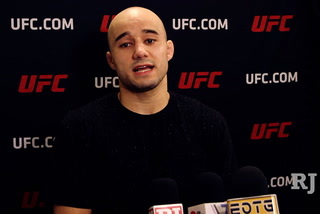 That prompted his move up to welterweight, where the veteran has made himself right at home. 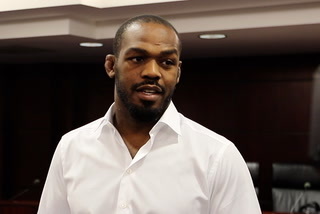 He’s already won twice at 170 pounds and will look to win for the third time in seven months. Cerrone is a very dynamic kickboxer with solid skills on the ground. He has backed himself into a corner by evaluating Story as an opponent with no ground game and only rudimentary jiu-jitsu skills. That’s probably not a fair assessment, but Story does prefer to launch powerful hooks and look for the knockout. 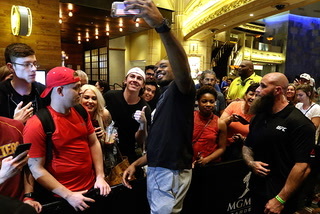 He returned from an 18-month layoff to score an impressive decision win over Tarec Saffiedine in May. It won’t be as easy as Cerrone has portrayed it, but he should continue his roll at welterweight. ■ Storyline: Many fans have never heard of either of these fighters, but it has potential to be the most entertaining bout on the card. 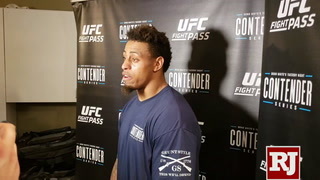 Perry makes his UFC debut with knockout wins in all six of his fights outside the organization. His ground game is a total mystery, but he probably won’t need it against Lim, who also prefers standup affairs. 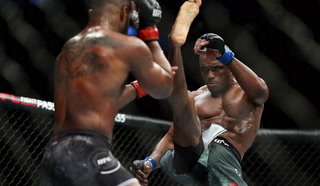 Lim is particularly dangerous in the clinch and he could use it to wear down Perry, who hasn’t spent much time in the cage with his early knockouts and will likely tire quickly with the adrenaline dump most fighters experience in their UFC debut. Somebody is probably getting knocked out and it might not take too long for it to happen. ■ Storyline: Homasi, who competed on Season 21 of “The Ultimate Fighter,” steps in on short notice to make his official UFC debut. Means is just happy to be competing. 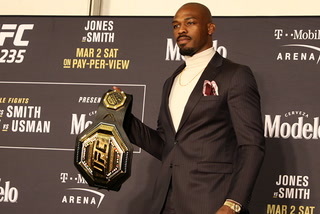 He was facing a two-year suspension for a violation of the UFC’s anti-doping policy and thought he may have to go back to welding until he could return to competition. He was able to successfully challenge the positive test by proving a supplement he was taking was contaminated and pled down to a six-month ban. Means is thrilled to be back, but was equally thrilled to clear his name. He was infuriated, however, when Homasi made several comments about him being a cheater. 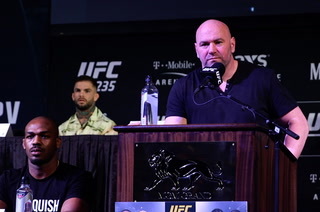 Means, who has won five of his last six fights, is now the more talented fighter and has had any potential lack of motivation wiped out by the animosity. It could be a bad debut for Homasi.